A bunch of places. Namely, not on Blogger. I mentioned this a little before, but I found myself in a place where I wasn't doing very much I could write about, and the things I normally blog about (nails, wax, hauls, etc.) weren't a high priority in my life. I realized that I was forgoing melting scents I really liked for scents I hadn't yet reviewed just so I could have content for the blog. That coupled with the Spring Blues, which seems to hit me every year around this time, made it hard for me to find the words to write. When I could write, the end product was amazing, but it was hard to keep that feeling. More often than not I would find myself staring blankly at the screen. I notice a lot of my other bloggy friends have had the same issue, which is really heartbreaking. Instead of wallowing in self pity -which I'm very prone to- I started occupying my time and mind with anything and everything I could. I've jumped head first (thank you, Too Much Gene) into several things based around planning. I picked up a very nice printer - an Epson 1430. And because Mama didn't raise no quitter, I went ahead and paid the extra pretty penny for a Continuous Ink System. Do I need a wide format printer that prints in high quality? Not particularly, but I might. All I knew was I had been doing research for several months and this was the one printer that met all of my wants and needs and hadn't been discontinued. Now if we ever need super high quality prints we can get it. Until then, I shall use this printer to print out silly sticker sheets for my digital cutter. My hair has gotten long. Since I made the decision between dying my hair and letting my curls flourish four years ago, my hair has gone through several-inch cuts every other month to chop off the bleached bits. The bi-weekly coconut oil treatment has made my hair look extra luxurious. Preparing for those treatments, however, doesn't look as nice. Like the caption says. 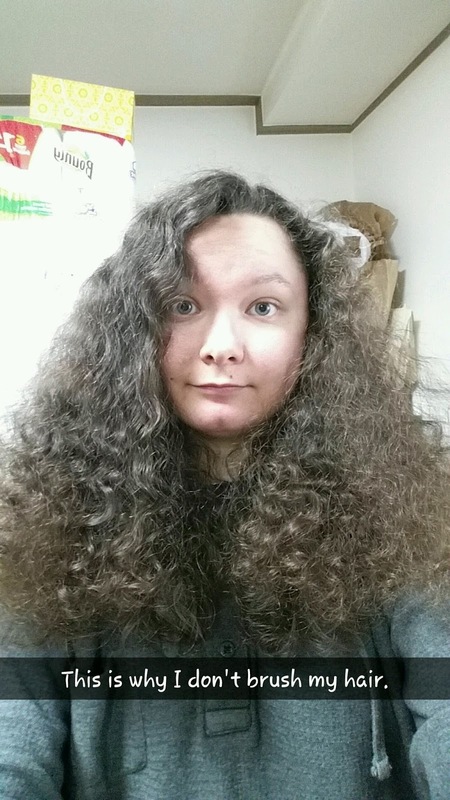 I don't know about you, but I'm not a fan of the frizz bomb that my hair turns in to once dried. I envy those who can dry brush for better hair results. On the bright side, I would have made a wonderful Hermione. LOL! We're still watching Nala. She'll be with us until May. She's just a little spoiled. It's taken a lot longer than I would have liked for me to get all of the stuff together for the Hamster Mansion Renovations. I've been on a very fervent hunt for wood and wire mesh/chicken wire/hardware cloth since the Summer. Each place we visited or thought we could get these items from turned out to be a bust. At one point in time I let my frustration take over and I stopped looking. I stopped watching various Pet Tuber videos for information and inspiration. I stayed off of the major hamster owner forums. 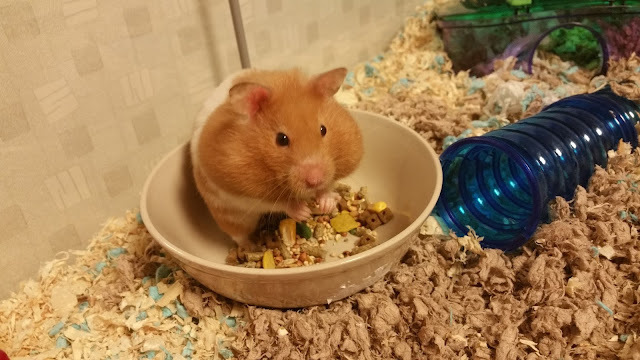 When I realized how much I had distanced myself from the hamsters and their care, I could only feel shame and it contributed a lot to how much I threw myself into their care and well-being. Last week Michael was able to talk to someone who directed us to a lumberyard. Nobody spoke English there, but I was finally able to get some wood for lids for the new hamster homes. That was the catalyst that took us on an adventure to IKEA. What for, you ask? Detolf Hamster Homes, of course! What do you mean, they aren't called Detolf Hamster Homes? They have a different purpose and they're really called the Detolf glass door cabinet?! I don't believe you. All silliness aside, yes I built what is commonly referred to as a DIY IKEA hamster home. IKEA is a wonderful place for hamster homes that give you more bang for your buck than trying to buy aquariums in equivalent sizes. I'll try not to get too preachy here, but if you plan to own any pets please, please do research outside of pet stores for pet care. Information is being updated so quickly pet supply companies can't keep up. 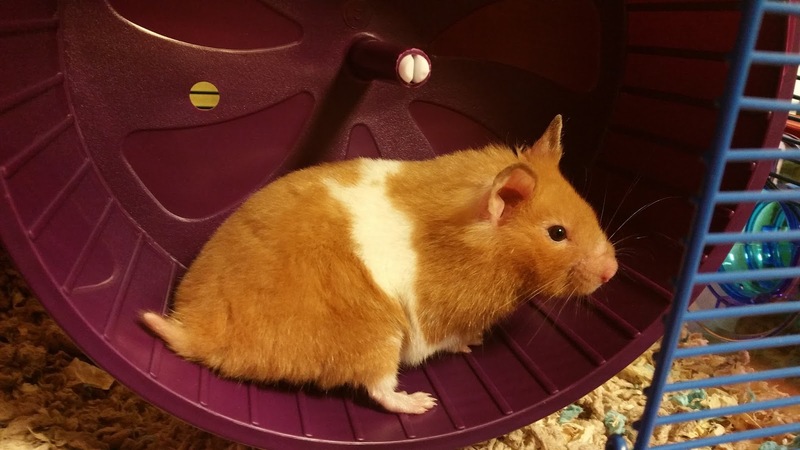 None of the hamster homes available in pet stores meet the minimum living space requirements and very few of these homes come with wheels that are properly sized for your hamsters. From me getting the hamsters to now, new information has been released that changed my plans for their homes. This wheel is way too small for the hamsters. There should be no back arching while running. Ah, much better. I may have gone a bit overboard on the wheel size (12") but I didn't want a repeat of their other wheels. When the Silent Spinners came in, they were properly sized for the hamsters. 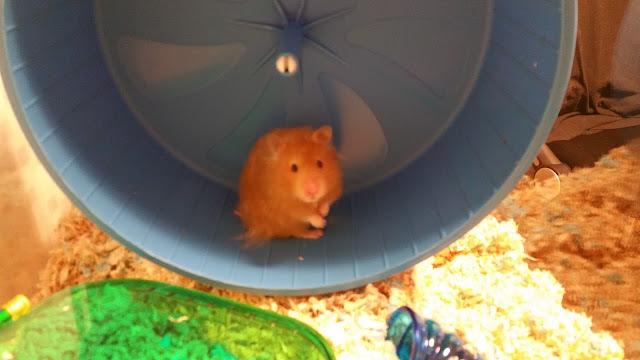 The wheels being too small now tells me that the hamsters have grown. Which shouldn't have happened if they were as old as their previous owners claimed. In other words, I have no clue how old these hamsters are but I'm glad that means I get more time with them. I've been enjoying watching the hamsters explore their new homes. Buny has taken to stuffing her pouches full of bedding and food, running on her wheel with her pouches full, then going to her nest and emptying her pouches. 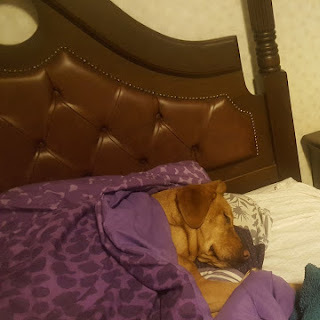 Every single night we see her going through this process. Such a silly weirdo. Hammy is a little burrower. I need to finish the lid before I can make their substrate as deep as it really should be, but I'm happy to see that these two seem to be settling in okay in the meanwhile. I don't want deeper substrate until I can make sure they won't enable Escape Artist mode and sneak their way out of their homes. Remember that Too Much Gene I was talking about? 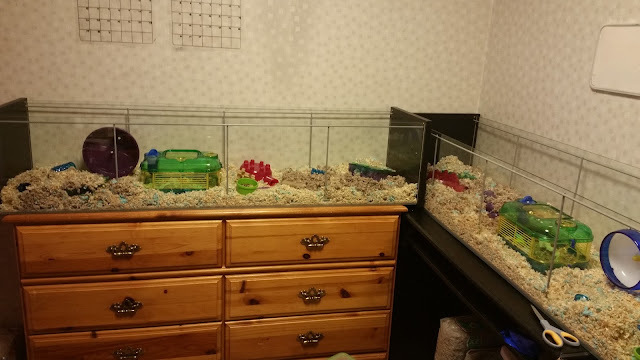 Since the Hamster Mansions became a reality, I've gone overboard on the hamsters. Homemade mealworm, fruit, and oatmeal baked cookies? You bet, coming right up. A well balanced diet with additional fruits, veggies, and an occasional piece of pasta? Check. Working on the plans for several homemade hideaways and buying several items to make themed cages? Not a problem. One flavor of yogurt drops just isn't enough to choose from, so let me pick up all the flavors. Bathing sand? Let me buy a large bag of children's play sand and then bake it in the oven to really make sure all bacteria and not-good-for-fluffies microbials are gone. Oh, hamsters enjoy regular dirt as part of their habitat? Let me buy some organic (no chemicals added is the main thing I'm looking for) soil to add to your home. Basically I'm spoiling the hamsters and they're living a much healthier life than I am. LOL. Okay, this is the best I can do for an update. I'll split my birthday weekend activities into another post so this can go up already. Once the hamster homes are 100% complete I'll take more pictures too! Sorry if this post seems all over the place. In true Liz fashion, I got sick on my birthday and today has been a very lazy day of recovery. Scarlette's new snake, Boopers, had some mites and an RI so we have been cleaning/treating his regular cage and in the meantime he is living in a Rubbermaid container. I am anxious to get him back in his desert tank habitat but also anxious if the mites are still lurking in crevices. I could buy a new tank but would rather try to use what we have. I hope Boopers' home becomes pest free soon! Rubbermaid containers are common for DIY small pet home. For the price, you can get some amazingly large living spaces for your pets. The only downside is if you have a chewer.